Once again the results of a Twitter poll were used to determine this show. The 2nd round of voting came down to Monogatari and Boku Dake ga Inai Machi and it was kind of close. Okay, not really. (Poll Runoff) What shall be the 2nd series I revisit and write about? 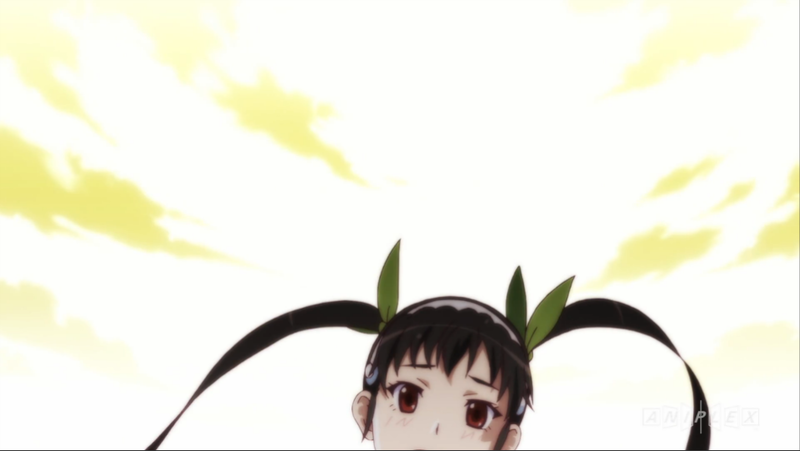 I have to be honest with you on this one, the whole Shaft shtick was wearing thin on me after Shinobu Time arc. I think HanaKana doing the “EEEEEEEEEHHHH” thing in class was the last bit of joy I got out of the series to that point in the prior Nadeko Medusa arc, and having her turn into a god was a small let down that was the final straw. I stayed on for Shinobu’s story, but ¯\_(ツ)_/¯ . Would this be any better nearly 3 years later? 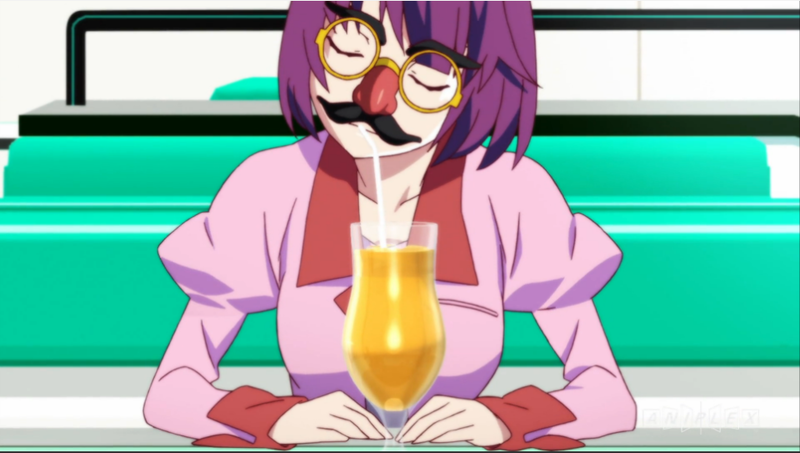 This disguise was so stupid it was good. The Hitagi End arc consists of the last 6 episodes of the series. The plot centers around Hitagi trying to save Koyomi and her own lives by having Kaiki Deshuu deceive Nadeko. In the end Kaiki is able to succeed, but it comes at the potential cost of his own life. My thought on the arc is that it was very enjoyable to watch until the very end when things just seemed to come out of nowhere. I think the fact that the arc started with Kaiki stating that things in this story were not entirely true. It just felt like that could be an in-character cop-out for anything ahead that didn’t make any sense. This was the perfect response. I’ll start breaking this arc down by what I did like. The arc starts off with Kaiki flying out to Okinawa because he told Hitagi that he was there instead of the Fushimi Inari Shrine (I’ve been there!) in Kyoto. They meet at a restaurant at the terminal of Naha Airport (I’ve been there too!) wearing ridiculous disguises. The scene really worked because it conveyed a sense of Hitagi hating Kaiki as well as hating herself for needing his help, but she had no other options. This attitude was consistent as she made sure she did absolutely nothing for him that had nothing to do with the deal they arranged at the airport. I also liked the OP for this arc since it was very 1980s/early-90s in style, which I would embed here, but Sony Music hates you and they don’t want anyone to actually listen to their music. Kaiki’s character on the other hand was very inconsistent. At times he seems to have a sense of morality; Hitagi offering to sell herself to pay him being what convinced him to take the offer, while on the other he completely burns Gaen Izuko by taking the 3 million yen offer to leave and staying anyway out of spite. He goes about his cons, but yet I’m still left clueless as to what the hell motivates Kaiki to do what he does. 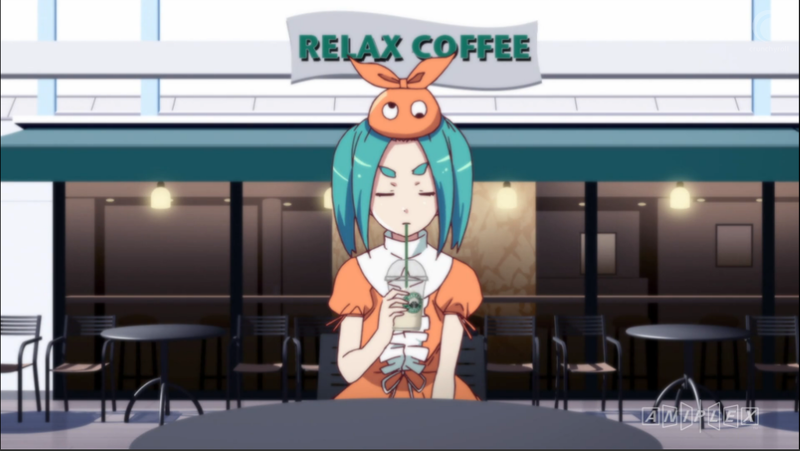 Ononoki appears too, which is a thing. As for the aspects of the arc I didn’t like there are a couple. First is the way surprises seem to come out of nowhere. 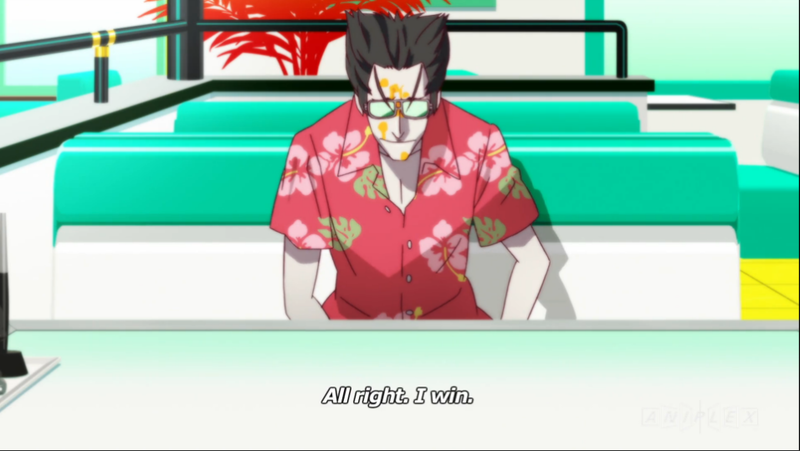 Yes, I know that Kaiki defeating Nadeko was hinted at by the fact that he looked in her closet a few episodes earlier. Yes, I now that Kaiki being attacked at the end was hinted at once a few episodes earlier. However, both of those moments of foreshadowing were dismissed by Kaiki earlier. He doesn’t seem like a great con man if he could forget about the person following him around as that seems to be a risk being in the con industry. Unfortunately I don’t have as much to say about this as I did for Shirobako. Maybe it just feels like another Shaft show by this point and doesn’t bring anything unique to the table anymore. After watching the rest of the arc, all I could think of was the fact that Kaiki had elevated himself to best girl status, and that I don’t have much of an interest at watching Hanamonogatari or Owarimonogatari or Kizumonogatari. There were never any guarantees that I would revise my opinion from participating in this particular feature. Better luck next time as they say.